Our finest lavender long-stemmed roses share their lustrous beauty amidst a bouquet of purple iris and mini calla lilies, rustic red Asiatic Lilies, red hypericum berries and an assortment of fresh and lively greens. Paired with a superior 8-inch clear glass gathering vase, this bouquet offers your most joyous sentiments. Your purchase includes a complimentary personalized gift message. Have them walking on air with a gift of flowers boasting exceptional blooms in a radiant array of hues. Our finest lavender long-stemmed roses share their lustrous beauty amidst a bouquet of purple iris and mini calla lilies, rustic red Asiatic Lilies, red hypericum berries and an assortment of fresh and lively greens. 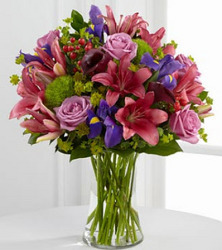 Paired with a superior 8-inch clear glass gathering vase, this bouquet offers your most joyous sentiments. Your purchase includes a complimentary personalized gift message.